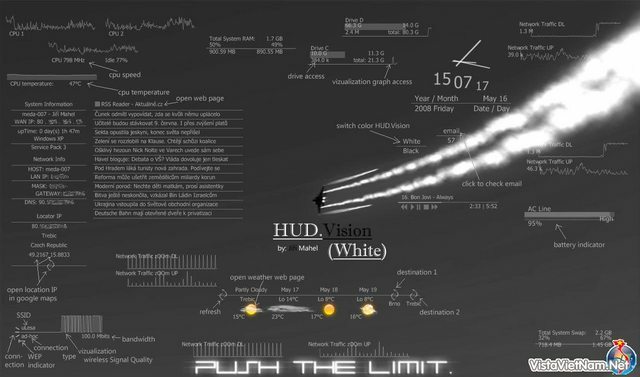 HUD.Vision version 2.2 NEW !! First install Rainmeter, then run the HUD.Vision installer and choose Rainmeter folder. This is the best collection of minimalistic widgets I've seen ever. I'm going to install Rainmeter right now! I thought it is a Samurize desktop. I haven't used Rainmeter before. Edited by kyosan, 03 July 2008 - 06:50 AM. I think people are impressed with those desktop meters not the wallpapers. Though these are also nice. Hallo, I am the author of HUD.Vision. Thank you for the beautiful assessment..
Edited by mepu, 05 July 2008 - 05:02 PM. Thank Mepu . Can U make a calender ? Welcome to WinMatrix mepu. Thanks for the updated HUD.Vision. Edited by mepu, 06 July 2008 - 05:18 AM. Edited by mepu, 06 July 2008 - 06:01 AM. I can't use it. This is mistake. Edited by kyosan, 06 July 2008 - 09:44 AM. I don't know why I haven't even tried Rainmeter yet. Edited by RickSOLET, 10 February 2009 - 01:56 PM. Edited by mepu, 06 July 2008 - 06:36 PM.